The Vikings 2016 Binge MCAL is officially over, but you can still make yourself a multipurpose shoulder cozy, that is like literally getting a hug from Ragnar himself! We chose the colors for this two-toned piece reminiscent of Ragnar’s beautiful blue eyes as well as the often rocky and icy landscapes the Vikings used to call their homes (as if you needed that one as an excuse! 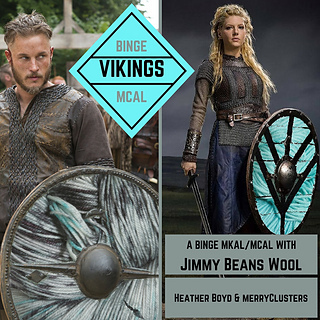 ), and hope you’ll crochet along with us while binging on Vikings episodes! 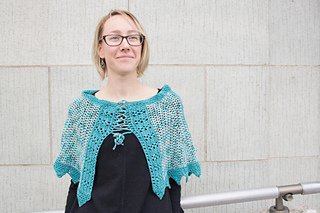 Heather, the designer of the knit version, the Vikings Binge MKAL, is the one who got me hooked (literally!) on the Vikings series (and I think she secretly has a crush on Travis Fimmel, but who doesn’t, right?) and on doing this MCAL - I’ve had lots of fun designing this one while watching! 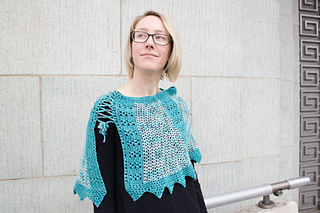 The pattern level is intermediate; it features several types of different stitches, including different types of half-double-crochets, and short rows. The piece is worked flat, but in several directions. The MXAL for Ragnar used a limited-edition color called ‘Ragnar’s Revenge’, which has since sold out. Seasons 1-3 of Vikings are available on Amazon Prime, Hulu, and on Blue-ray/DVD. Season 4 can be found on the History Channel.